John in school uniform in 1937 aged 8. John and Terry pictured at the White House. Behind them is the Jaguar that drove them to the White House in North Hall Road. 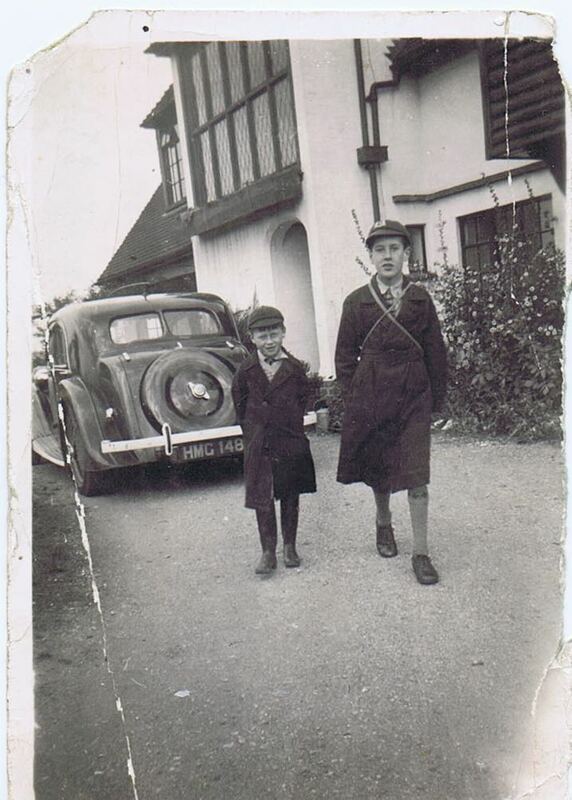 Notice the two straps over John's shoulder - one was his satchel, the other was his gas mask which they had to carry to school and back each day. Kings School, Chingford taken around 1936 (John is in the centre of the back row with a tie). He notes that he always looked unkempt in his school pictures. In November 2018 the editors met a sprightly 90 year old John Evans at his home in Kent. Here is his story of being evacuated with his younger brother Terry in September 1939 from Chingford to Henham. John, aged 10, had been helping harvesting in Ongar in the summer of 1939. However, his life would now change. Here are John's memories of his evacuation to this village. By 1938, the fear of another European war was quite apparent, and so gas masks were given out, house to house, to British families. I can still recall the horrible rubbery smell and how difficult it was to breather with one on. Leaflets and notices were issued at this time, advising on how to convert your cellar or cupboard under the stairs into a refuge room in case of an air raid. In London and the surrounding outskirts, Anderson shelters were being erected in people's back gardens. These were made of six curved corrugated galvanized metal sheets bolted together at the top, with two steel sheets ay either end (measuring about 1.95m by 1.4m). This was half-buried into the ground and earth heaped on top (some people planted colourful gardens on top thinking it would be an excellent disguise - editor). With an entrance in one end, it would accommodate six people or more if bunk beds were built in. There was also advise on black-out restrictions, so people rushed out to buy thick curtaining, black paint, brown paper, cardboard and drawing pins, to blot out the least glimmer of light from windows in case it should help enemy raiders. Meanwhile the blackout proper had begun on the 1st September, when all street lights were extinguished, and cars crawled along the roads with dimmed and hooded headlights. Pedestrians tripped over kerbs, twisting ankles and bumping into one another ! Road accidents soared, whilst road deaths almost doubled that month. During the summer of 1939, we used to have gas mask drill at school and in the shops and offices, two or three times a week. By now there were some 1.5 million people involved in civil defence, including air-raid wardens, ambulance drivers, first aiders and fire fighters. Two-thirds of whom were volunteers, recruited from local boroughs. Municipal shelters were built of brick and concrete, and trenches were dug in the local parks. City skies were transformed by the appearance of huge silver barrage balloons, floating like enormous whales tethered by mooring ropes to winches on flat-bed lorries. These were designed to combat low-flying enemy aircraft and although giving a reassuring presence, if they broke loose in bad weather, could wreak havoc, smashing chimney pots and cause damage to roofs and cut tram and trolley-bus cables. By now political entreaties and ultimatums to Hitler following his invasion of Poland were of no avail. I have to tell you now that no such undertaking has been received, and that consequently this country is at war with Germany". Thus began a whole new era not only for me but for everyone. Prior to the actual outbreak of hostilities, plans had been made to evacuate not only government officials and their documents but children above all, were thought to need protection. No one was compelled to go, but the authorities offered plenty of encouragement and in the four days ending on Monday, 4th September over 1,800,000 children were moved to areas of comparative safety, from Britain's great towns. My brother Terry and I were among those to be sent away from home to an unknown destination in the countryside. On that Sunday morning, just after I had listened to the Prime Minister's broadcast, we walked to our school in King's Road, Chingford, with a small fibre case each, containing a change of clothes, pyjamas, toothbrush and comb and washing kit as well as our gas masks in a cardboard box slung around our necks and a packet of sandwiches. They took no toys with them. Here a fleet of red London Transport buses were waiting to take us to our new 'home' somewhere out there. After a tearful farewell we headed off through Epping Forest in a northerly direction and the bus drove to Henham. John doesn't think that their parents knew where they were going. By now all our tears were forgotten, children all excited and happy, as we set off for what was to us, a great adventure ! After twisting and turning through country lanes, we stopped for our packed lunch somewhere, and then carried on into the early afternoon. Unfortunately the latter part of the journey I recall was spent on the open platform of the bus, as my brother, not a good traveller, was quite sick. Eventually we reached a small village, and after our teachers, who had accompanied us on the journey, had taken us to the local church hall, we awaited our new foster parents. For some reason or another, Terry and I were almost the last children to be collected. Maybe as we did not want to be separated, people were loathe to take two boys, the younger having been obviously ill during the bus ride. (I shall never know). Suddenly a voice called out "I'll take those two". Looking around I saw a tall, dark-haired man of about thirty years old dressed in a tweed suit, with a broad smile on his face. "Come on, you two", taking us outside, I was amazed to find a grey Jaguar saloon car, which he told us to get in. He then drove us through a long winding lane, down to a large white house standing back from the lane along a gravel drive. We were greeted by an old golden labrador retriever whose kennel was alongside the house. We were ushered into the large kitchen and introduced to our new 'parents' Mr. & Mrs. Lipman, who had a baby daughter named Sylvia. They told us the beautiful beautiful golden retriever dog was called 'Sally' and that she lived outside all-year round in the large wooden kennel, which I had seen on our arrival. They also had a live-in maid named 'Mattie', a local village girl [editor: Martha E. Claydon born 1925], I guessed to be about 15 or 16 years old. Mr. Dudley Lipman was a chicken farmer. He, his wife Ida (nee Balaam) along with their young daughter Valerie were very kind. Dudley's brother Gordon Lipman was involved with British film-making. I remember they gave us some tea, and after a bath, showed us to a small bedroom on the first floor. Terry and I slept in what now seems was a large single bed, and poor Terry, just over 7 years old, I recall cried himself to sleep, cuddling up to me ! It subsequently transpired that we were in the small village of Henham, on the Herts/Essex border, about 5 miles from Bishop's Stortford, the nearest large town and as the crow flies, some 30 miles from my home in Chingford. By present-day standards not far but then, with no motorways, nor direct train nor bus services, might as well have been a 100 miles away. Within an hour of our departure from Chingford we later learned that the first air-raid siren was heard and that people ran into the forest to hide from the expected raid ! However it was a false alarm but it brought home the reality of what was to come. The day after we arrived, we had to report to the local school, close to the village hall, where we had been collected the day before. But no Jaguar to take us back to the village ! We had to walk back uphill, a mile and a half each way, between the field, along the winding country lane, with no footpath, only deep water filled ditches on either side. When we reached the school, all the children were placed in their appropriate classes, with of course the local village children, who stared in awe at these 'Londoners' ! Needless to say, within the first few days there were a few differences of opinion between the locals and the 'furriners' ! They were taught by the female teachers, who had come with them from Chingford, Miss Reader, headmistress and Miss Chapman. John passed his 11+ exam but was still at a junior school and he became a teacher's assistant until he eventually moved to Newport Grammar School after about 6 months. John remembers they had split classes and Ann confirms this in her memories. As my parents had wished me to stay with my brother, I was in somewhat of a strange position from an educational point of view. I was now 11 years old and had passed my '11-plus' exam the previous summer. I had attained a place at the newly-built Chingford County High School in Nevin Drive, Chingford and due to start in September. Many of my friends who were also due to start there were of course evacuated with the new school to Coleford in Gloucestershire. So you can imagine that the local school at Henham, as well as me were in quite a dilemma. Eventually it was decided that until a local secondary place for me could be found, I was to assist the teachers with some of the younger children. This temporary arrangement lasted for the next two or three months, until just before Christmas, when we returned home for the festive season, as the phoney war (a period of strange quietness and uncertainties, following that first false alarm) still existed. You must understand that this was the first time we had seen our parents since being evacuated, as they did not visit us until some time later during the Spring of 1940. There were visits from their parents about once a quarter. I recall that when they did eventually make the long journey to visit us for the day, we were more interested in the comics such as Beano, Dandy and Hotspur and lay on the floor avidly devouring these papers whilst our parents chatted with our foster parents in rather an embarrassed atmosphere. How thoughtless we must have been, not realising they wanted to talk and play with us for just a few precious hours. John remembers receiving a German Schuco toy car at Christmas, which would move when he breathed the word 'Go' over it. It soon became apparent that my schooling was suffering although I believe that I quite enjoyed helping the teachers, perhaps not realising that I was falling behind in my initial introduction to secondary education. It was therefore decided that I should go to the local grammar school in Newport, a small village a few miles away from Henham, reached by the local railway line, from Elsenham station , within walking distance of the 'White House'. This school was at the far end the high street, set back from the road, a very imposing building, having been founded in the reign of Queen Elizabeth the First, in 1688. The school had an excellent reputation and i seemed to settle down very quickly. I was in Saxe House and wore a blue cap with red and gold circles around the crown, with a gold dolphin badge above the peak. The first class i was in was the remove and this was situated behind the main school buildings, and reached by an outside iron staircase on the first floor of a newly-built block. It was adjacent to the main hall's upper gallery, through which we had to pass to reach our class of some 20 pupils. On the large stage at the far end of this hall was a grand piano, and one afternoon after lessons were over, I sat alone listening to one of the sixth formers practising. I was spellbound with his music as he played 'Jesu Joy of Man's Desiring' and 'Fur Elise'. Even now when I hear these two pieces I am moved to tears such was the effect of this unknown pianist. I never found out who he was. Strangely enough although away from home, I seemed to thrive at this school. Even achieving high marks and achieving position within the top three of most subjects. Meanwhile living in the country was a new experience, and Terry and I would help our foster father collecting eggs from his farm, plodding through the fields in our wellies with mud up to our eyes. Also once the harvest had been gathered in, the fields were left with stubble some 5 or 6 inches high which we used to pull out of the ground and throw at one another, together with some local boys, as if they were stick grenades during our battles. Snaring and shooting rabbits was also another favourite pastime, as of course with meat rationing, rabbit pie or stew was a welcome extra. However it was suddenly decided that my mother wanted us back home, she was obviously missing us and Terry was terribly home sick. Whilst Terry returned to Chingford, I was billeted in a completely new environment, namely the local village inn, The Bell Inn in the centre of the village. This was owned by the Balaam family, Mrs. Lipman's parents. I never really found out why I was moved, perhaps after Terry's return they had had enough of us both? [Editor - A lot of children were moved between properties in the village]. A totally different household than before. This was a really old country pub, with low beams, and a rickety staircase to the first floor where I now lived, with a pump for water in the back yard, a far cry from the comforts of the White House. But this elderly couple Mr and Mrs Balaam were very kind and affectionate to me. Very strict rules applied, I was never allowed in either of the bars during opening hours. However being in the centre of the village did have it compensations, with more activities and friends closer to hand. John recalled some businesses in the village. There was the Starr Garage with one petrol pump. Willet's shop opposite the school for sweets. He also remembers that there was a house by Elsenham station, where he could exchange his sweet ration coupons before he got the train from Elsenham to Newport School. Once again, due to the travelling difficulties to my new grammar school, it was decided that I should be moved to a new home in Newport village. Here I was billeted with the Goodfellow family. This couple with a son Richard, slightly younger than me, took me in and I suppose I became a brother to him, almost a 'second son'. They had originally come from Goodmayes/Ilford area of Essex, she having a pronounced cockney accent, and one, so have been told, I started to acquire. I soon became part of a happy family, making new friends both at school and in the village, falling for one of the local girls, Pauline Saggers, daughter of the local grocer, who did not reciprocate my feelings ! However I was soon to find another paramour, the headmaster's daughter Barbara Wilmott at my new school and would go to her house for Sunday lunch. 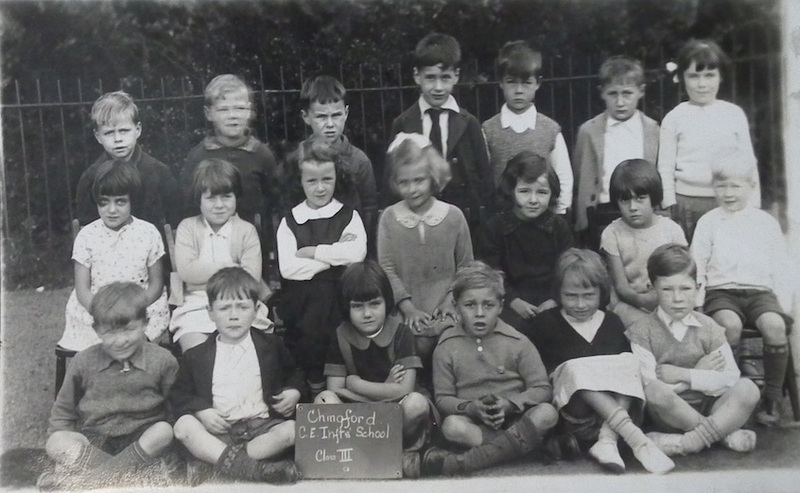 As mentioned before, for some reason or other, I achieved good results in most subjects, later to be joined by another evacuee from Chingford, John Hughes, who had also been at King's Road School, son of the local ironmonger in Station Road, Chingford. I remember the PE master, a Major Walker, who also taught physics, his son was in my class, and we became good friends. However, one day whilst on the sports ground opposite the school building, chasing each other around there was a clash of heads. To my horror and shock I found that I had broken my large front tooth. I still recall the sharp pain of the exposed nerve and the frantic search for the missing piece ! What I would have done with it if found, I don't know. Apart from this unfortunate incident, I have fond memories of Newport Grammar School where for the first time I really enjoyed learning. All through the Phoney War in the autumn of 1939, no bombs fell to justify the mass exodus from Britain's cities, and gradually the evacuees trickled back to the towns and the war seemed quite distant to me, until one evening a lone German bomber, returning from an air raid, from whence I know not, decided to jettison his last remaining bomb over Newport. It landed in the fields just across the road from the Goodfellow's house, causing no damage, only a large crater in the ground. That was enough for my mother, who, upon learning of this incident, decided it was time for me to return home to Chingford (note: re Goodfellow family, M. Goodfellow worked for the local Newport Council as the chief foreman or manager of the local council yard just 5 minutes from home. This was situated in the same country lane as the grammar school close to the local river, which had a small footbridge and "water-splash" allowing vehicles to cross and enter the council yard to collect sand, gravel, cement and tarmac and tools etc for the local town maintenance. It was at this river I saw my first kingfisher in all its gaudy plumage, catching small fish from the water one morning on my way to school. My return home coincided with the end to the Phoney War, when Hitler renewed his Blitzkreig, invading Norway and Denmark in April followed by the invasion of the Low Countries and France a month later. Meanwhile Winston Churchill had replaced Neville Chamberlain as Prime Minister.